Breaking news! 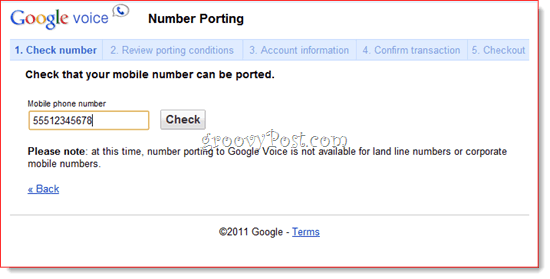 Google just released the ability to port your existing number to a Google Voice number / account. Previously, you had to get a new phone number to use with Google Voice, which was a significant inconvenience, since you had to ask all your relatives, co-workers and stalkers to update your contact information. But now, you can take your existing phone number and have it go straight to Google Voice, just like you can when switching cell phone providers. First, I’m going to show you how to do this. Then, I’m going to tell you why doing so is a waste of time and money for most of us. Let’s press on! Log in to your Google Voice account and Click Settings and choose Voice settings. Go to the Phones tab. If there’s a link that reads Change / Port next to your phone number, Click it. If not, then Google hasn’t let you in on this feature yet. You’ll just have to wait. Click I want to use my existing mobile number instead. Type your existing phone number into the box and Click Check. 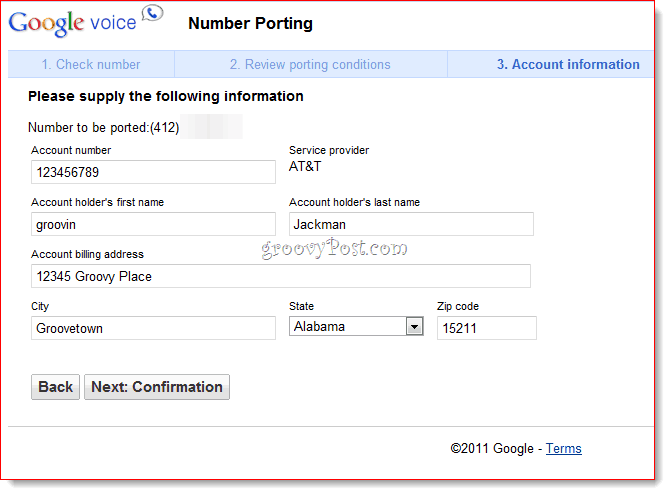 This is the phone number that you already own and use and want to use with your Google Voice account. Pony up $20 bucks. You heard me. If your number can be ported, Google will charge you $20 to make it happen. But that’s not all. If you’re porting a cell phone number, you may be charged an early termination fee by your current phone company. Depending on how far into your contract you are, you could wind up paying $200+ to port your number. Check the box next to The cost of porting is $20 (payable through Google Checkout). Your mobile phone service plan will be terminated when you port your number to Google Voice and you may be charged an early termination fee. 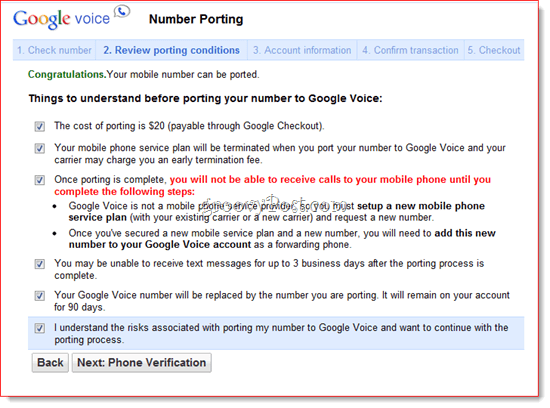 You’ll lose your existing Google Voice number after 90 days when you port a number. Click Next: Phone Verification if this is still worth it to you. Google will now verify your phone by calling you and having you enter a verification code. This is so you don’t try to steal someone else’s number. 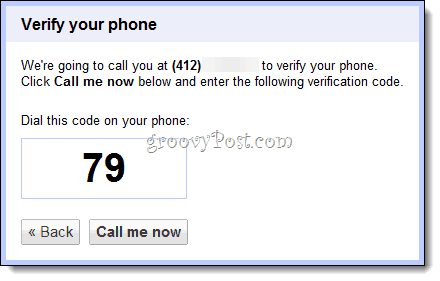 Click Call me now and enter the code displayed when Google Voice calls you. Note that the call will come from your existing Google Voice number. On the next screen, enter your account information with your existing phone service provider. Check your bill or monthly statement for your account number. Make sure you enter your name and address just as it is on your billing invoice or monthly statement. Click Next: Confirmation when you’re done. Okay, you’re on your own from this point on. All you have to do now is confirm that the information you entered is correct and Click Next: Google Checkout so you can pay your $20 to port your number to Google Voice. You’ll need a Google Checkout account. Anyway, like I said, you’re on your own from this point on. 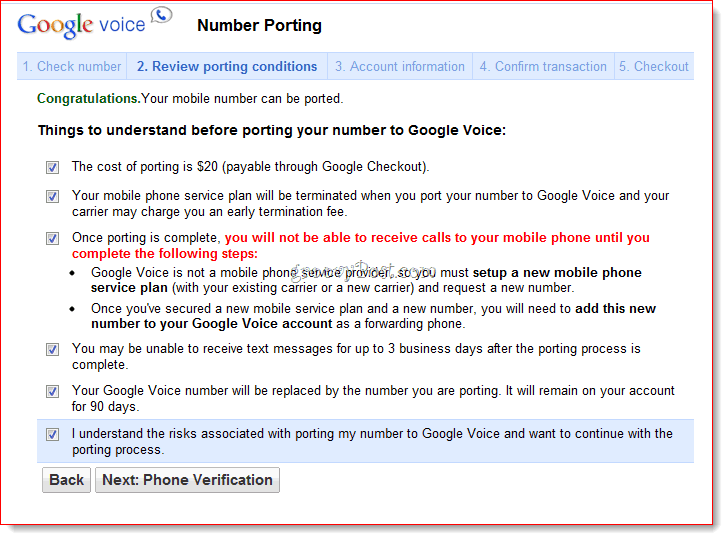 I am not going to port my Google Voice number, mostly for the reasons stated above. I don’t feel like paying a one-time fee of $20 just so I don’t have to get new business cards. Besides, you don’t even need to get new business cards to benefit from Google Voice. That’s because AT&T (and I’m guessing most other cell phone providers) allow rule-based call forwarding for free. Currently, I have all missed calls forwarded to my Google Voice voicemail, so I get the best of both worlds. I get to keep my old number, but I get Google Voice’s groovy web-based voice mail (with fairly passable voice-to-text transcription). Meanwhile, I’ve begun using my actual Google Voice number for business purposes, which means it’ll be easy to transition down the road. But until then, both my Google Voice and AT&T number work just fine. Both ring my iPhone. That, I think, is the best way to use Google Voice with your existing phone number. In fact, you can even have iPhone forward calls to another number by enabling Call Forwarding in Settings. You don’t get the full Google Voice functionality, such as Groups and call recording for incoming calls, but you don’t have to pay $20 or early termination fees. And remember, even when you port your number to Google Voice, you don’t get to cancel your landline or cell phone service. If you really want to use Google Voice without landlines or cell phones, you might be able to port a SkypeIn phone number. I’ve read on forums that people have successfully ported their SkypeIn numbers to Sprint, so I imagine you can port your SkypeIn number to Google Voice as well. That may be the winning combination—I’d love to hear from anyone who attempts it. But for now, I think Google Voice’s support for porting numbers is more of a symbolic development than a game changing one. Don’t get me wrong, I’m excited about this—I’m excited because I love Google Voice and I think it’s going to get bigger and better. This is the next step. It’s just not one I’m going to participate in and can’t in good faith recommend it “yet” to any of you in our groovyCommunity. You can’t port landlines yet, and porting a Skype number to Google Voice isn’t going to turn GV into VOIP any more than porting a cell number to GV would make GV a cell phone. VOIP on GV depends on your use of gtalk/gizmo5, not porting. Hi –thanks for the comment and input. Good to know that you can’t port landlines yet. And you are right–porting a skypein number wouldn’t be particularly useful unless you were already using your skypein number as your primary line. But you COULD port your cell number to GV and then forward it to Skype and cancel your cell plan. Then you can make outgoing calls from Gchat call phones and take incoming calls via Skype. It would all be the same number to them. Yeah but… Porting the number to Google voice just sounds… expensive and, there’s no turning back. I’m with you – Just forward the number to GV and test it out / play with it until your cell plan expires. If it works out, make the switch then. Wonderful points altogether, you just won a new reader. What may you recommend about your put up that you just made some days ago? Any sure? I have been forwarding my home phone to my GV number for like a year. This way, someone calls the “house” and it rings mine and my wife’s phone. So, basically, I am paying for a land line only to be able to use the number. I am very close to just biting the bullet and using my GV number. It’s just that it is a pain. SO many people have to be notified. I keep hoping magic will happen and GV will port my home phone. When I tried to port my AT&T iphone number it said that it wasn’t available in my area. Do you know why an AT&T number wouldn’t work? I have had this number for years and want to keep it. I like the idea of not having the phone company control my number which has value to me. If Google has it, at least I can receive calls from my resume. This solves how to take advantage of GV voicemail features and not have to change numbers. Have you thought of a solution on how to take advantage of GV free texting and still have people use your ATT number for texting? What I’m wondering is if I forward all my calls to my GV number will that forward my text messages as well and will ATT charge me for the text messages which are forwarded. I apologise in advance if this has already been addressed: Say my bloke comes to visit me in my apartment building, he enters a code that is sent to me via the land-line phone jacks in my abode. I don’t have nor need a land-line phone service, just any phone that can connect to the wall jacks, and then I pick up, depress a number in order to let whomever into the building. OK? So I want it so that when someone buzzes my room number, it get auto-forwarded to my iPhone where I can answer and let them in accordingly. Possible? Any thoughts, any-one. Highly appreciated. Love this blog! Great Post. Very helpful. 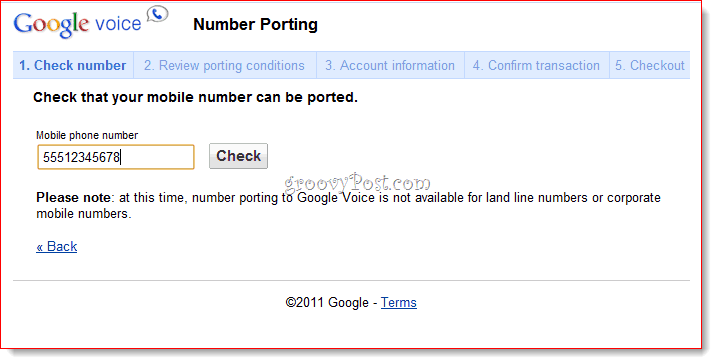 It saved me from porting my mobile number to google voice. Unanswered calls to my mobile phone were going to my mobile carrier and not to google voice. I had to go to google voice settings and delete or deactivate my mobile number in google voice and then reactivate it. After doing this, unanswered calls to my mobile number went to google voice. I did not have to port my mobile number to google voice and pay $20. Thanks Jack Busch.